But it is precisely doing this loving thing, while not feeling like it, but to bring joy to the one you love, that makes a noble, romantic thing out of throwing together some flour, sugar, butter and cinnamon on top of berries and sticking them in the oven. Having said all that, maximum effect with minimum effort is helpful when you’re sleepy, so here’s a super easy recipe for blueberry crisp that’s a sure winner of any husband’s heart. It was the first dessert the author of The Kitchen Confidant made for hers! Happy cuddling! 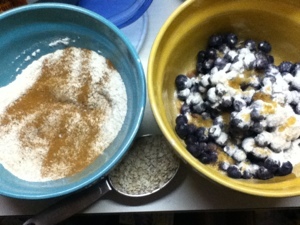 The only change I’ve made is to drizzle a little lemon on the blueberries, when mixing them with flour and sugar, and to use raw sugar, which gives a nice little crunch. Simple and sweet!